This year will be about as dry as last year. This is bad, as 2014 was the fourth to eighth driest year in 106 years of recordkeeping, by most reasonable reckonings. This year will be a little different overall, but quite different in some areas, both better – Santa Cruz – and worse – eastern San Joaquin Valley. Statistically, last year’s drought is about a one in 15-30 year event. With a changing climate and growing water demands, we should prepare for such droughts occurring more than once a generation. As detailed below, Northern California will be critically dry, having about the same precipitation as 2014 (more in some basins), less snowpack and more storage in some of the largest reservoirs. 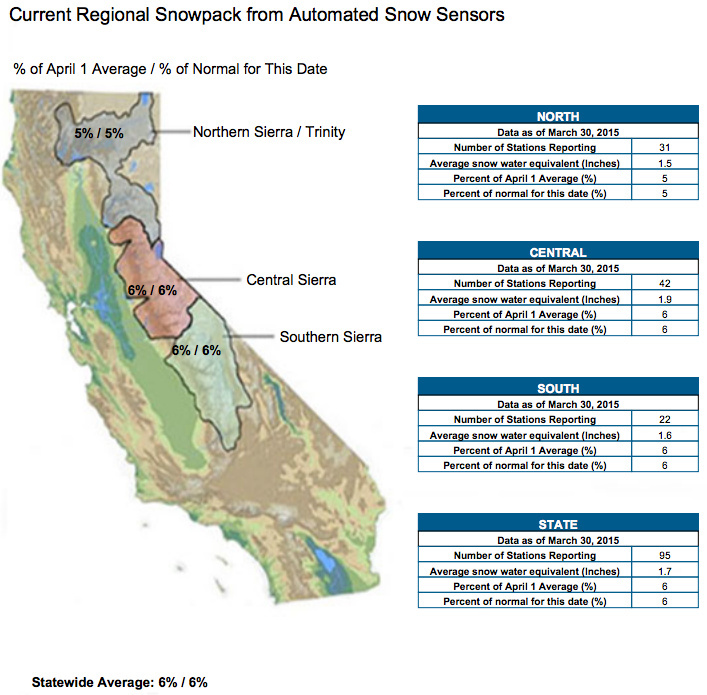 The southern Central Valley is as dry or drier than 2014, with abysmal precipitation and snowpack. The western side benefits from having more water stored in San Luis Reservoir than in 2014, but the eastern side has less water remaining in its major reservoirs. Southern California is in similar shape as in 2014 for surface water. Little time is left in California’s “wet” season, and the forecast for the coming week or so is quite dry. What we see is probably what we’ve got. Water allocations for the State Water Project are small (20 percent), but better than last year’s 5 percent allocation. Federal Central Valley Project allocations are likely to be 75 percent (and perhaps 100 percent) for higher-priority contractors, 25 percent for cities, and zero for everyone else. Some locally supplied eastern San Joaquin Valley irrigation districts are delivering no more than 30-35 percent of normal supplies; Merced Irrigation District is delivering no surface water. Junior water-right diversions in the Central Valley will be curtailed. After reservoir withdrawals last year and little refill this year, eastern San Joaquin Valley will be hit much harder this year. Tulare basin water shortages are about like 2014 or worse, and Sacramento Valley shortages are about the same or a bit less. Almost the entire state has less groundwater because of three previous years of drawdown. More wells are likely to go dry, particularly for rural households and small water systems, but probably also some irrigation wells. California will not run out of water this year, or next, if we are careful. We will respond mostly as we did last year, with some modest changes. Making rain is not an option. In many places, groundwater will be less available and farther from the surface than last year, with more dry wells and more expensive pumping. Somewhat more surface water will be available in some places, including the North Coast, Santa Cruz, Sacramento Valley and western San Joaquin Valley. Less will be available for eastern San Joaquin Valley. Further reductions in urban water use are likely for the Bay Area and Southern California. Drought impacts on fish and wildlife and hydropower should be similar to those in 2014. Economic and environmental factors will dampen many popularly espoused or feared actions, such as widespread ocean desalination, extensive capturing of stormwater, vast reuse of treated wastewater, eliminating exports of water-intensive foods, abandoning major irrigation districts, fog water collection, iceberg towing and importing water from Canada, the Colombia River, the Great Lakes or anywhere else. Less extreme water management activities should be adequate, less costly and better environmentally, even for much more extreme droughts than today’s. California is not running out of water. Droughts bring public and political attention needed to make major changes in water management, such as last year’s historic groundwater legislation. Strategic changes usually require serious long-term problems and thinking, and the urgency of a drought or flood to focus policy discussions. Water measurement and accounting. The 2009 drought brought legislation that began improving basic data on surface water use and groundwater levels. Much more is needed to tighten California’s water accounting closer to that of other western states. Improved water-use data is unlikely to require massive new reporting, but rather improved coordination of existing reporting, some new reporting, and perhaps remote sensing estimates of crop water use (as is done in Idaho). Some additional reporting, such as requiring large water users to “call” their use during drought, would improve use of available water and add reliability to both senior and junior water rights. For better accounting to occur, the state needs a common comprehensive and workable regional water accounting system serving both the State Water Resources Control Board and the Department of Water Resources. Groundwater. A dry 2015 seems only likely to accelerate implementation of local and state groundwater sustainability efforts. Perhaps the best outcome would be legislation to speed groundwater basin adjudications and better empower and guide local groundwater sustainability agencies. Consolidating state groundwater data and analysis now scattered across agencies and programs would be another positive outcome. Water markets. More expeditious and transparent trading of water rights and longer-term water rights contract. From a statewide perspective, the amount of water traded would be small, but the economic and environmental benefits would be great. Water markets are also probably the best means to provide flexibility and incentives needed to improve groundwater recharge, coordinate storage operations, appropriately conserve water, and revitalize environmental water management. Reducing net water use. A primary response to water shortage is to reduce water use in ways that conserve the most water with the least economic and environmental cost. This applies to all water-use sectors during droughts and in the longer term. Improving water rate structures and economic incentives with pricing and markets will be important here, even for some environmental water uses. Sacramento-San Joaquin Delta. Water diversions from the Delta are unfortunately central to California’s water system. They will be less during a drought, but what remains becomes quite valuable. The economic value of the diversions will likely increase with climate change and groundwater sustainability, as local areas seek additional external water supplies. After groundwater, the Delta is probably the state’s most strategic water problem. This year’s drought will provide opportunities and motivations for long-term progress on managing the Delta. Overall, the drought of 2015 will be a challenge. We can complain and suffer with the usual lament over water waste (by others, of course), or we can make inconvenient and sometimes costly changes for the better. No “Miracle March” this year. We had appreciable precipitation only in December and February — one sizable storm each month. 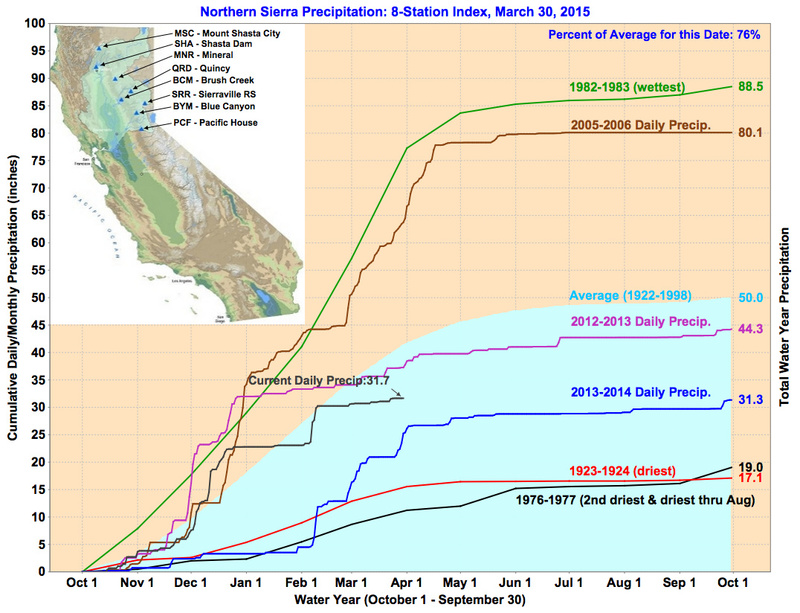 The other months were almost entirely dry for most of California. North Coast streams are in better shape, but the Sacramento Valley is only slightly wetter than in 2014. San Joaquin and Tulare basins are about as dry as this time last year, with dry weather forecast for the short remainder of the “wet” season. 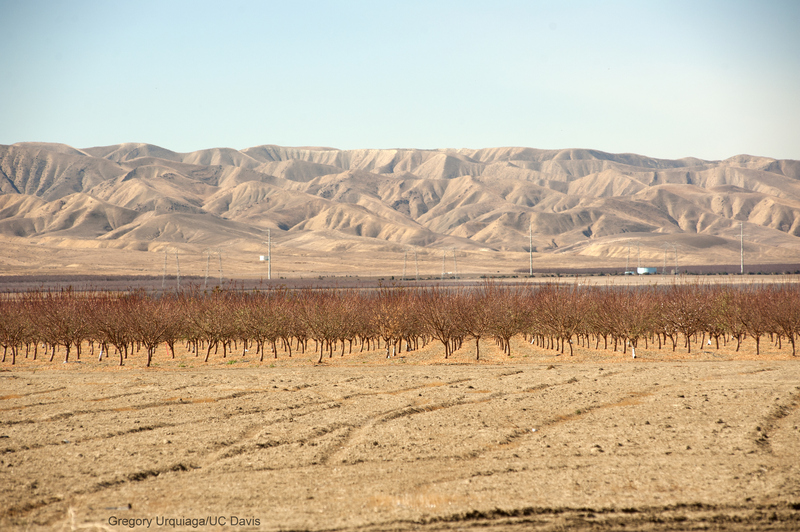 2015 could be the driest year of record for the southern Central Valley. Snowpack is a little worse than last year, perhaps the driest on record statewide. As of March 29, the Northern Sierra (Sacramento Valley) Precipitation Index was down to 76 percent of average to date, slightly higher than that for all of 2014. Source: California Data Exchange Center. For updates, click here. 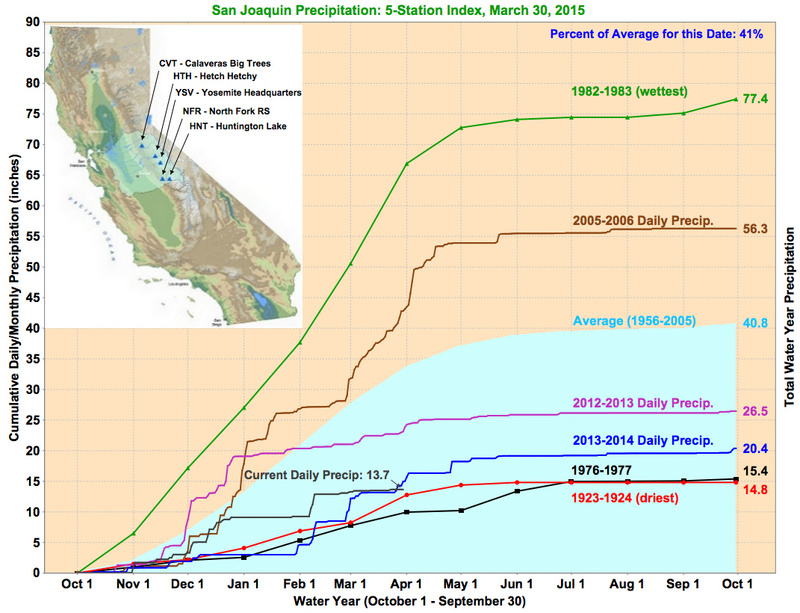 Precipitation is less than half of average for this time of year in the San Joaquin Valley. Snowpack is a little worse than last year, perhaps the driest on record statewide. Source: California Data Exchange Center. For updates, click here. 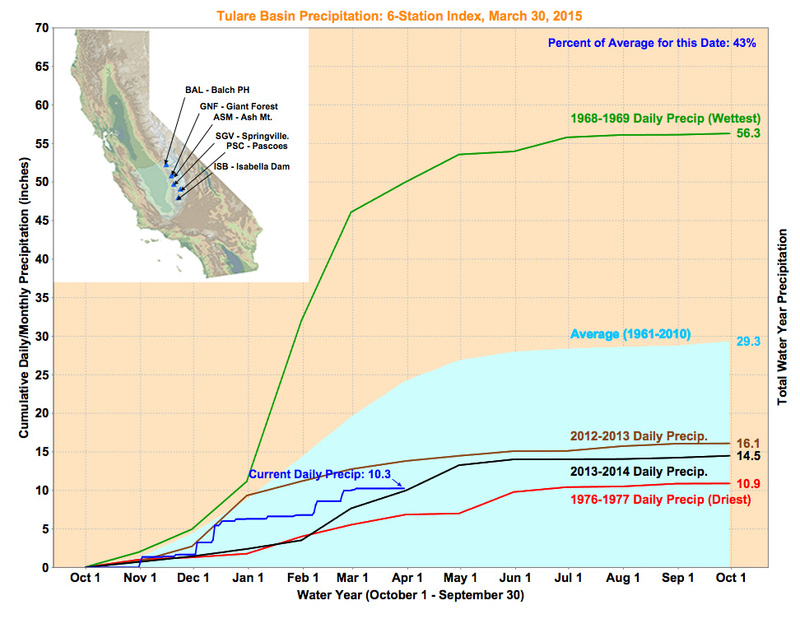 Tulare basin has a shorter record though it has the most water use in California. Source: California Data Exchange Center. For updates, click here. Reservoir storage is better overall than last year. Still, it’s about 6 million acre-feet below average with no prospect for much refill from snowmelt. 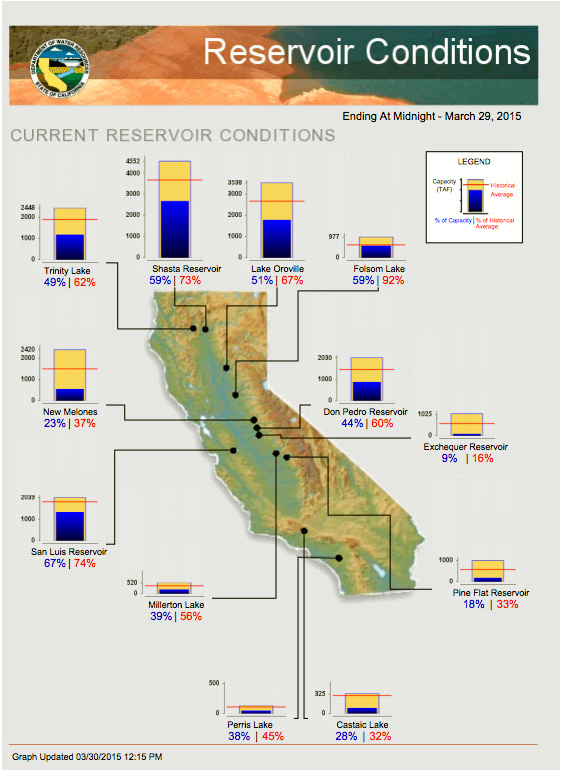 The big reservoirs in the Sacramento Valley are 1.3 million acre-feet fuller. Storage south of the Delta is about the same, though distributed differently. San Luis Reservoir, which serves the state and federal water projects, is about 600,000 acre-feet higher than they were a year ago, but the large reservoirs on the San Joaquin River tributaries are about 600,000 acre-feet lower. Exchequer Reservoir is at 9 percent of capacity. Groundwater storage is probably about 6 million acre-feet less than this time last year. Aquifer levels will generally be lower than a year ago in the areas highly dependent on groundwater. Thank you Jay for a reasonable assessment. It would be great to add a chart showing the increased demands associated with the transition to permanent crop in the San Joaquin Valley. The eastern foothills whose groundwater in part recharges some of the valley aquifers are now being tapped for additional nut tree acreage to be irrigated with groundwater. That will further accelerate the depletion of CV basin aquifers. We all need to acknowledge that there should be limits to water access for agriculture. Communication with groundwater is often complex but in the Sacramento Valley communication between groundwater in excess of 5 miles was proven during the 80’s. The mining and selling of groundwater needs to be prohibited now and overdrafting regulations need to be adopted and enforced regardless of big agricultural interests which in no way reflect the concerns of the general public. I’d like to know which kinds of aquifer are where at what depths, and what’s expected to happen when rainfall increases. I recall that in California most droughts end with flooding (because the rainfall doesn’t soak into dry ground, in part) and wonder whether any rapid recharge of aquifers is possible in those conditions. I doubt it will ever happen, but the extreme activity of eliminating non-essential animal agriculture would certainly be better for the environment. Just thinking outside the box… And I know it would be an engineering challenge… Perhaps some right-of-way issues… But what’s the problem with an enclosed aqueduct from the mouth of the Columbia? This is fresh water that could potentially be put to use. After all, we put men on the moon. Why can’t water be piped in for a few hundred miles?